Clever tyre choice helped Alain Prost win the British Grand Prix and in so doing open a six-point gap over Nelson Piquet in the drivers' championship. 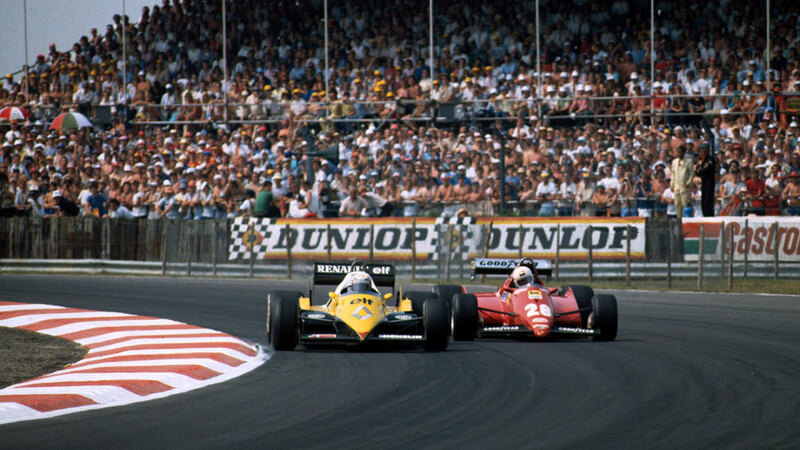 On the eve of the race Prost had become the first man to lap Silverstone at more than 150mph but despite that the Ferraris of Patrick Tambay and Rene Arnoux hogged the front row of the grid. The Ferraris stormed into an early lead but within ten laps their Goodyears had started to blister while the Michelins on the Renaults had no such problems. That allowed Prost to attack Arnoux and he passed his former team-mate at Copse corner four laps later. The next target for Prost was Tambay who was frustrated with the way his tyres had deteriorated and eventually lost his lead at Copse on lap 20. Once clear, Prost ran away from the pack and was only briefly headed when he pitted. Nelson Piquet moved his Brabham-BMW up to second ahead of Tambay while local fans were delighted to cheer Nigel Mansell who brought his Lotus-Renault across the line in fourth ahead of Arnoux. It was a remarkable effort by Lotus who had built the new 94T in weeks and whose mechanics had worked sleeplessly to get the car ready. So unready was the car that Mansell qualified in the old Lotus. "The car is transformed," Mansell said. "No more vibration, no more oversteer, perfect balance. It's a wonderful feeling not just for me but for the whole team. We've been through difficult times but the team has never given up." Mansell was involved inadvertently in a collision as he crossed the line. The Alfa Romeos of Mauro Baldi and Andrea de Cesaris were right behind the Lotus but both a lap in arrears and as Mansell slowed, Baldi pulled to the right and hit his team-mate. John Watson staged another one of his increasingly common charges through the field. After starting 24th, he climbed to 11th before being delayed by a long pit stop, eventually finishing ninth. There was a brief but nervous delay for Prost when Tyrrell lodged an objection against Renault and Ferrari's use of a water-injected fuel system but that was soon rejected by stewards. Prost's win, at the scene of the Renault turbo concept's debut in 1977, put him six points clear in the championship. It was also the last time the British Grand Prix was staged on a Saturday.